should have been a “gimme” on my list of revered reads. Although there is a brief nod to the mania and depression Lincoln was known for, Grahame-Smith’s Lincoln is a humorless, flat-lined grump compared to the witty and wise, larger-than-life Lincoln of “historical reality”. All that is admired of Lincoln’s philosophies, diligence, beliefs , ambitions, intelligence, and humanity, takes a back seat to the immediacy of his cranky self-training and his eventual equally cranky “if-I-feel-like-it” hunt of vampires. The true-life discussions of slavery, and Lincoln’s reasons for desiring its end, are mixed muddily into the pool of fantasy. Perhaps because I’d previously followed the trajectory of the story, I didn’t offer patience for the scattered plot plots. The first portion of the tale is deep and textured, but the real meat of the book, the adventures of a vampire hunter, is lacking and disjointed. The idea was good and had such potential, but the author kept grasping for solid creation with, “and I want to add this, and that part of history, and that other part, and this character, and this historical figure, and and and andandand.” There are too many story-lines that veer off and never reconnect; the inconsistencies are numerous. A modern day writer (a la Anne Rice’s Interview With A Vampire) who doesn’t return, an ancient immortal character whose richness is undeveloped, random crashes into historical figures much like 19th century bumper cars, a horrific scene with nod to Robin Cook’s Coma that goes nowhere, the unexplained change from review of Lincoln’s fictional journals to periodic first-person Lincoln narratives. Let it not be claimed I do not exhaustively scour a book. I remain uneasy about Lincoln’s fictionally redirected passions. 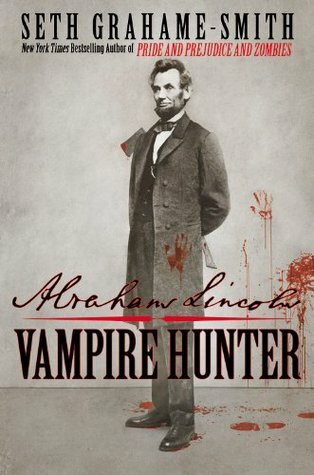 I would have liked to see Lincoln as a vampire hunter in addition to all that he was and stood for, rather than a deconstruction of the genuine-hero to make his actions central to the fictional-hero’s hunting. My fascination of history and Lincoln seems to have trumped my fascination of horror and vampires, and I’m comfortable with that. There is one part I did, however, enjoy thoroughly. Abraham has befriended a man he briefly mistook for a vampire. The two pass time and tales together in New Orleans bar. Abe couldn’t help but smile. Here was a strange little man with a strange way of seeing things. […] He drank to excess and spoke in an irritating, high-pitched voice. It was hard not to like him. Among my varied editing projects, two have been a twist on something familiar in shared human history, and one of those is a brilliant “mash-up” that could be shelved with AL:VH. (I will say now, the author with whom I worked has a tale far more unique and thrilling.) This trend is exciting and limitless, and something I hope to see much more of. But I’m going to have to stick to my original impression of AL:VH. As for the movie, I’m told it is better than the book. I’ll wait… until it’s on cable… non-pay-per-view cable… maybe.